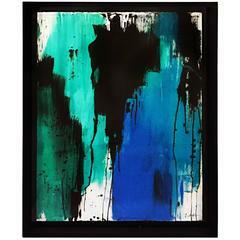 Blue, black, and green abstract painting on paper by Jenna Snyder-Phillips, 2013. Blue, black and green abstract painting on paper. 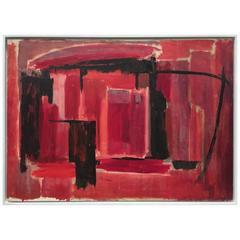 Large mid-century abstract painting in black and reds by Phillip Callahan. USA, 1960's. Gouache and gesso on heavy rag paper in wide white wood frame. 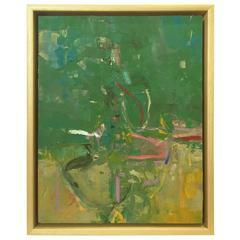 "Abstract #13" oil on board in greens and yellows by Steven Johanknecht, 2013. 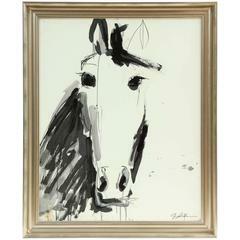 Decorative horse painting by Jenna Snyder-Phillips. Sumi ink, charcoal and lacquer on 100% cotton paper. Abstract Impressionist painting on canvas signed R. J. Serrano, dated 1977. Bold, polychromatic brush strokes on a black contrasting background creating a vivid, eye-catching painting. 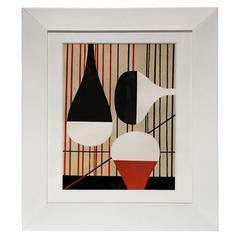 Abstract painting by Mark Gaskin, oil and wax on canvas. 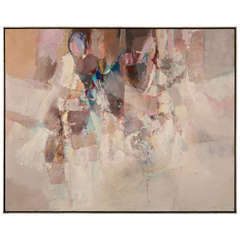 A signed abstract painting, circa 1980's by O. Ventura. Abstract acrylic painting on canvas by contemporary artist Jeff House. 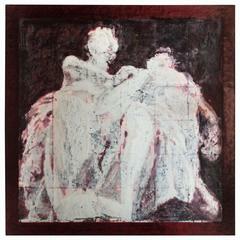 Painting measures 48" wide and 36" high. Abstract oil painting on canvas by Lucho Gutierez.